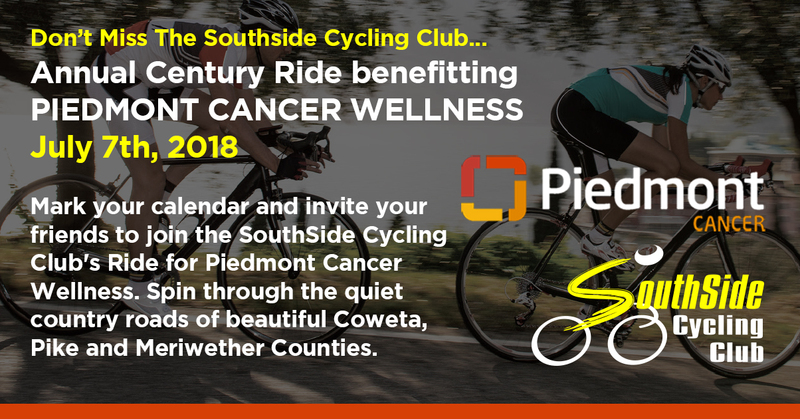 Mark your calendar and invite your friends to join the SouthSide Cycling Club’s Ride for Piedmont Cancer Wellness. Spin through the quiet country roads of beautiful Coweta, Pike and Meriwether Counties. Well-marked routes include 8-mile family ride, 31, 66 and 103 mile distance options. Gently rolling terrain makes the 31 and 66 mile routes as fast as you like. The century becomes more challenging as the hills and the temperature rise. This ride is fully supported with well-stocked specialty rest stops and SAG vehicles, plus post-ride refreshments. Make it a weekend getaway in historic Senoia, filming location for The Walking Dead and numerous movies. Triathletes welcome! Proceeds from this ride provide support to Piedmont Newnan Cancer Wellness. As a not-for-profit hospital, Piedmont Newnan provides supportive services to cancer patients and their caregivers through its Cancer Wellness facility. This facility provides complimentary professionally-led programs such as yoga, massage therapy, professional counseling, support groups, cooking demonstrations, art therapy and many more to anyone who has ever been diagnosed with cancer.